Investments similar to investments for high net worth individuals can help smaller investors achieve the same profits. Only the top earners have enough wealth to invest in up and coming businesses. The top earners also have high enough net worth that enables them to use the services of famous investment firms. However, is investing with an investment firm a smart move? Paying others to invest your own money isn’t always the best deal. This article is not about investments that are inaccessible to the general public. Money Bear Club won’t list off 5 mid-sized German firms and the most profitable forests in the world. Because investing in them requires wealth that few investors have. Money Bear Club will instead provide creative workarounds. These workarounds help to invest in the same way as high net worth individuals do. Learning from investments for high net worth individuals can create a path to similar outcomes. The problem many investors experience is that “it takes being rich to get rich”. It’s easy to recognize that investing in an up-and-coming business will bring in nice returns. More so, if the business is in an industry that is always in demand. Businesses that provide consumers with basic necessities are guaranteed to bring in stable returns. Hence, most investors should be seeking to invest in similar companies. After all, these companies are likely to provide stable returns on investment. Yet, few ordinary (lower net worth) investors can invest in businesses like these (e.g. food, energy). Crowdfunding exists, but it’s a territory of fringe businesses and the technology sector. The median investor in USA owns a stock portfolio worth $13,869 or €12,194. With just over $10,000, investing in worthwhile businesses is almost impossible. Few businesses (if any) are going to bring in a small and an unknown non-institutional investor. Even fewer will do it for an investment of just over ten thousand dollars. That is not the case for high net worth individuals. They either have the ability to use the services of venture capital firms, be an angel investor, or just to use their connections to secure investment deals. Everyone loves exclusivity. The rarer an investment firm invests in startups, the more they will be vying for the attention of it. Startups are not looking for the “average Joe” investment. Investors with lower net worth should deal with this fact, and look for cheaper workarounds. Some workarounds can help to achieve the same outcomes as investments from high net worth individuals. Instead of giving up on exclusive investments, investors should look for workarounds. For every investment that is hard to get in, there is at least one creative solution how to get the same gains with less money. Let’s explore some of the investments for a lower net worth, and with the same high gains. Who wouldn’t want to be an angel investor? Angel investors are high net worth individuals or groups (syndicates) who invest during the earliest stages of company development. Some angel investors invest into companies that just have business ideas, rather than a finished product. Being an angel investor comes with very high risks. No one can be 100% sure that a business won’t become bankrupt in year or two. More so, when a business is just idea on the paper. It’s possible to lose large sums of money this way. The median investment made by an angel investor in UK is £45,000. This shows that 50% of investments made by angel investors in United Kingdom are bigger than £45,000. Coming up with this sum of money could be hard for the average UK resident, as the average savings in the UK totalled £26,180 in 2017. That less than 60% of the median investment made by an angel investor in the UK in 2017. An investor with lower net worth could work more hours or gamble with riskier investments, just to gain the starting capital to become an angel investor. This path would likely require significant amounts of effort, and for higher risk investments, risk tolerance. Hard work for investments with higher returns is not the best path towards becoming more wealthy. Lucky for lower net worth investors, there are workarounds to being an angel investor. Workarounds: venture capital trusts, crowdfunding, working in a startup or being a co-founder. Risks of angel investing alternatives. Copyright: Money Bear Club. Venture capital trusts are the main workaround for investing like an angel investor. Venture capital trusts make the same investments as angel investors do (investing into startups). The only difference is that they are publicly traded companies. The capital trusts make their shares available for all investors. Investors then can buy the shares of venture capital trusts. Thus, investors can indirectly invest into startups without being angel investors. If the investments of the venture capital trust become profitable, the share price is likely to rise. This, thus, benefits the shareholders. Charitable causes are not the only way to use platforms for crowdfunding. Crowdfunding platforms are also a method startups use to raise money. Crowdfunding enables smaller investors to invest into startups (and receive equity), without investing very large sums of money. Working for a startup is one the less-explored ways of investing like an angel investor. It requires actual work in exchange for the equity of a new business. However, in this case, equity is received without large investments. Being a co-founder of a startup is mostly reserved for experienced professionals. Working for a startup is a path towards business equity. And this path is suitable to most workers. High net worth individuals or families often use the services of a home office. A home office is essentially a “one family investment firm”. High net worth individuals usually invest through their own investment offices. Home offices are legal entities which represent the interests of one person, or, more commonly, one family. A home office is often composed of one or two financial and investment advisors. They will be the ones responsible for the investments of a high net worth family. The services of a home office are expensive. A home office includes at least one financial advisor. The average salary of a financial advisor in USA is $76,000. Other fees, like health insurance and sick leave, are also taken care of by the employers. Another similar investment is private equity. Private equity firms buy stakes in distressed firms and help them to flourish. Top private equity firms have achieved gains as large as “39% over 25 years“. The problem is, investing in private equity is open only to high net worth investors. These are the investors who earn more than $200,000 per year, or have a net worth higher than $1 million. This condition excludes most retail investors. Workarounds: investing in the firm, buying its options. The most basic workaround of achieving similar gains to investing with private equity firms? Buying their stock. Many private equity and investment firms are publicly traded. Their share prices are accessible to most investors. If an investment firm reports good financial results, the shareholders can expect to earn money from the rising share price. Buying options of investing firms is a lesser known way of achieving similar goals as high net worth investors do. If an investment firm is on an acquisition spree, its share price will likely fall. Thus, it’s rational to buy option puts, and profit from the falling share price. If an investment firm is expected to sell its shares in the businesses it has invested in, its stock price will likely rise. In this case, it’s rational to buy options calls. This would help an investor to profit from the rising stock price. Hedge funds are investing instruments that come with high costs. Not only do hedge funds have management fees, they also have performance (profit) fees. Some hedge funds also get away with charging the investors “exotic” fees. These fees include, but are not limited to, travel and consulting fees. 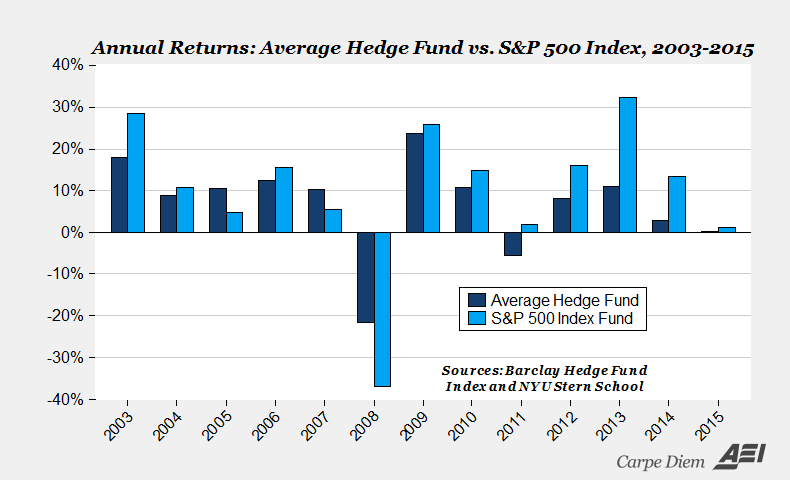 Average annual hedge fund returns. Source: https://blogs-images.forbes.com/timworstall/files/2016/01/hedgefund.png. For higher net worth investors, paying a 2% + 20% (standard hedge fund management and performance fee) would not be financially difficult . Paying the same fees for lower net worth investors would be harder. Workarounds: mutual funds, index funds, venture capital trusts. Cheaper alternatives to hedge funds are mutual and index funds, and buying shares of venture capital trusts. Mutual funds are the most expensive option out of all three. Mutual funds, like hedge funds, also use the 2% + 20% payment fee structure. Moreover, mutual funds have a minimum investment threshold. The threshold could be a barrier to lower net worth investors. Investing in index funds can be done through 401(k), and index funds don’t come with high costs. It’s possible to invest in an index fund that tracks the S&P 500 index, and to enjoy the same gains. Investing in the shares of venture capital trusts is also a workaround for investing into hedge funds. Venture capital trusts invest in smaller companies in the UK. Venture capital trusts are publicly traded companies whose shares can be bought on the stock exchange. Buying shares of a venture capital trust is very similar to directly investing into smaller, up and coming, companies. Real estate is one of the only investments left that is unlikely to lose value in 20 or 30 years. Sure, if it’s a house in a city that is Detroit 2.0, the investment value will decrease. For all other real estate objects, an investment in them is a conservative way of growing wealth. And real estate can double in value in 7 to 10 years. Many famous businessmen have made their fortunes from real estate. Since having a place to live in is a basic necessity, it is obvious that investing in real estate is very profitable. However, there are barriers to entry related to real estate investing. The first one is price. Real estate isn’t a cheap way to invest money. The median price of new house in USA in 2017 was $335,400. Median asking rent in USA. Source: https://www.zerohedge.com/sites/default/files/images/user5/imageroot/2014/04/Asking%20Rent.jpg. A median house in USA will then become profitable after renting it out for 419 months (34 years). In reality, the number of months before a property becomes profitable is a lot smaller, but in theory, the numbers tell a different story. This comparison is not 100% accurate. The comparison is made between 2017 house and 2014 asking rent prices (2017 data was not available). The average price of a house in UK in 2014 was £200,000. UK average house price. Source: https://www.globalpropertyguide.com/Europe/United-Kingdom/Price-History. Mean weekly rents in England. Source: https://assets.publishing.service.gov.uk/government/uploads/system/uploads/attachment_data/file/501065/EHS_Headline_report_2014-15.pdf. For the average investment in real estate in UK to become profitable, it would take 278 months (23 years). Although the time period before real estate investments become profitable is very long, in reality, the numbers may be different. First off, rent prices are rising. Hence, the time before a real estate investment becomes profitable will, consequently, be declining. Also, many real estate investors buy houses and apartments with the intent to sell, rather than to rent. This could contribute to a shorter time period before the investment pays off. The second barrier related to real estate investing? Knowledge about the real estate markets. The knowledge about investing in real estate is mostly acquired from the practice of investing. And without having mentors, family, or friends in the sector, it may be difficult to acquire it. Knowledge about real estate investing can be found on blogs and websites. However, it often is inconclusive and not up to date. These two factors can contribute to lower net worth investors making unprofitable investments in real estate. Or, altogether, foregoing investing in houses and apartments. Real estate crowdfunding is a relatively new type of investing. Real estate crowdfunding platforms receive projects from real estate developers. The platforms analyse the probability of success of the projects, and then approve only the best ones. When real estate projects get put on a crowdfunding platform, investors can choose them based on their preference for risk. The higher risk a real estate project brings, the higher the dividends for the investors will be. After a project receives the investment sum they were seeking, they’ll start building and paying off the investment. Although the dividends will be the same for all investors, a 10% dividend from $10,000, will bring in more profits than a 10% dividend from $1,000. Real estate crowdfunding does not come without risks for the investors. A builder may go bankrupt or the project might not sell well. If these events were to happen, the investors would likely have a hard time getting their investment back. Yet, real estate crowdfunding offers a way of overcoming barriers to entry in real estate investing. It’s possible to invest very small amounts of money. Since the projects are analysed by professionals before getting posted, investors only browse the approved projects. At first glance, it may seem like investments for high net worth individuals are far better than other investments. Having to have a net worth of $1 million just to invest in private equity seems rather excessive. It seems worth it when the returns are considered (25% to 50%). A lower net worth investor may manage to increase their wealth through a higher salary or higher investment returns. Yet, it does not mean that the returns from investments for high net worth individuals would be worth the effort. Not only investments directed at high net worth individuals have underperformed (1,2,3), but they also have completely failed to deliver profits. One example of investments for high net worth individuals failing to deliver profits is the EFH shale gas story. EFH was an electricity provider in Texas. To simplify, the deregulation of the electricity market in Texas created a possibility of larger profits in the energy sector. This attracted new and large investors for EFH. However, for EFH and its large institutional investors (e.g. KKR, Goldman Sachs), the gains from deregulation didn’t last long enough. New technologies in shale gas extraction decreased the price of electricity, and made EFH unprofitable. Thus, investments from large firms were poured down the drain because of technological advancements. There are more stories like this one. Even large investment firms have failed to predict future trends and events. The same is true for smaller retail investors. However, an unsuccessful investment in a private equity firm, will do more financial damage than a OTM expiry of an options call. A high net worth does not guarantee the success of investments. Exclusive investments do not necessarily outperform cheaper investments. Learning from the examples of successful investments, and adapting them to the realities of each individual investor, is a far more realistic way of investing successfully. Focusing on goals that are hard to achieve can serve as motivation for work. Yet, it can be better to come up with creative solutions that achieve the same outcomes as those goals.